I feel much more confident addressing the issue of racism after this course. Chris was very passionate about what he does. His workshops were honest and realistic. The SRtRC Wales Team were back out on the road last week delivering training to forty six BA Ed. Primary courses in Newport for the Teachers of Tomorrow. The conferences were delivered to over students in total at the Caerleon Campus. 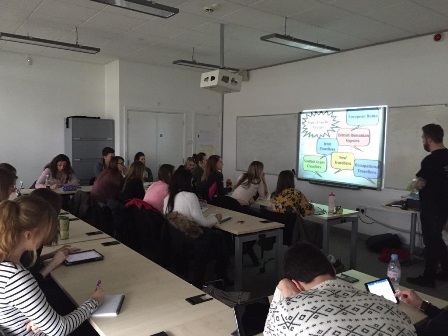 The training continues to prove hugely popular with staff and students whose feedback was overwhelmingly positive and was reflected in the level of engagement and interaction over the whole day event. High numbers continue to report that until our conferences they have not received any anti-racism training. The sessions included a practical look at SRtRC’s resources for using in classrooms as well as looking at some scenarios that teachers may be faced with once working in schools. The team also tried out their new workshop based on the myths of Immigration. First up was an introduction to the day, delivered by Welsh Education Manager Ian Simpson. It was a session that looked at the legal definitions of racism and racist incidents, steps to take to deal with issues and aimed to ensure that the trainees felt comfortable asking questions and fully engaging in workshops. Then students took part in a terminology workshop, led by Education Manager Ian Simpson and Education Worker Chris Stokes, accompanied by newly appointed Education Workers Noam Devey and Lindsey Bridgeman and Sessional Worker Steve Jenkins. This workshop aimed to improve the trainee’s understanding of racial language and to widen their knowledge of acceptable / unacceptable words. The session also looked into the reasons why certain words are unacceptable by going back into the history of their use and the links to pain and suffering that exist. Next was the workshop discussing the hot topic of Immigration. This workshop was created by Education Worker Chris Stokes and after evaluating the student’s feedback seemed to be the most favourable. Chris broke down the different types of migrant and looked very closely at myths that exist in society. Finally there was a chance for the Trainee’s to try their hand at some of the activities that the SRTRC Wales Education team use in schools. Each activity was linked to a real life scenario and the trainee teachers were asked to discuss how they would deal with it. All of the training would not be possible without the help and support of NUT Cymru (National Union of Teachers). The teaching union have been a vital part of the progress Show Racism the Red Card has made educating the teachers of tomorrow about dealing with racism in schools. The campaign will also partner the union for several of the conferences to deliver a joint conference where NUT Cymru will be educating the teachers on some very important aspects of teaching and also the “perils of social media”.